Facilities: The site provides paved access to Bass Lake with two boat launches, two courtesy docks, signage, and a paved parking lot with 17 stalls, including one ADA accessible stall. The Department of Natural Resources owns approximately 2-acres of land on Bass Lake maintained by St. Croix County. 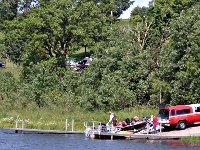 There are docks for fishing and a boat launch. The shore land is muddy and not considered as ideal for swimming. In 2017 St. Croix County acquired an additional 13.76 acres of adjacent property with St. Croix River Crossing Mitigation Funds.